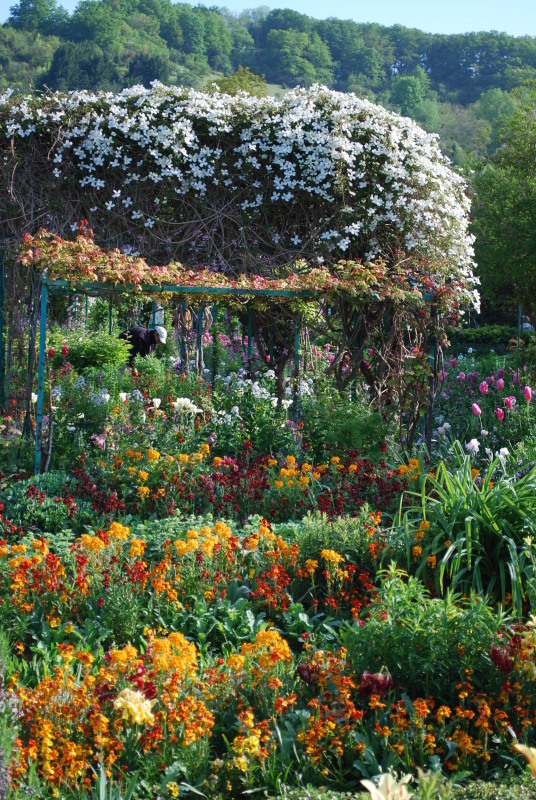 How many gardeners are there at Giverny to tend Monet’s garden, is one of the questions visitors ask most often. The five acre garden is maintained by eight gardeners. Some visitors don’t believe me: eighty? they repeat, unsure they have heard well. No, eight only. They do a fantastic job. In the garden, flowers are changed twice or thrice a year, according to the seasons. When spring flowers are spent they are replaced by summer flowers. This enormous task enables the garden to look very different through the seasons. Spring flowers are small, whereas summer flowers are giant, as tall as sunflowers. In November all the flowers are pulled out again, the planting of the spring bulbs will take several weeks. The very skilled gardeners of Monet’s estate have a lot of work to do during the winter also, while the property is closed for five months. In addition, most of the flowers are self produced in greenhouses located in the village of Giverny. This keeps several gardeners busy year round. It is a hard job to be a gardener in heaven. Are the irises in flower yet? When the change over from Spring to Summer flowers takes place are there plenty of other plants to bridge the gap or does it look barer for a while? Here it is catwalk time for flowers at the Chelsea flower show this week. Some have been held back and some brought on ahead of their time and it is odd to see plants in flower together from different seasons.